As an Interior Designer, it is imperative that you are competent at creating accurate and precise floor plans that are presented at a professional standard. This is for two reasons: 1. A floor plan needs to assist your design processes when making decisions about space planning, furniture layouts and circulation requirements, and 2. They also need to support discussions with Tradesmen/Architects etc. and most importantly your client; enabling you to accurately and confidently communicate your designs and vision for a space. It’s for the above reasons that the floor plan is central to the role of the Interior Designer. 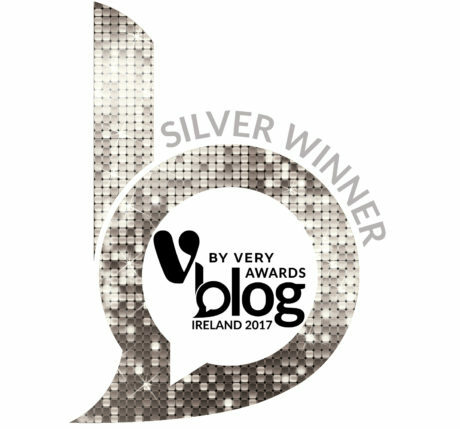 Which is why we’ve decided to list our expert tips on how you can produce floor plans that are accurate, precise and of a professional standard. Plus, helping to set standards in the Interior Design industry when it comes to the production of technical drawings using SketchUp, is high on our list of priorities as an online learning platform. Decide on the most appropriate style and level of detail for the viewer. For example, an Architect or Electrician will require a much more technical approach than your client. Don’t waste time producing a rendered floor plan when a simple black and white technical one will suffice. When you’re running a busy Interior Design business, you can’t afford to waste time including furniture in a lighting plan when it doesn’t need to be there (unless it’s fitted like a kitchen/bathroom). 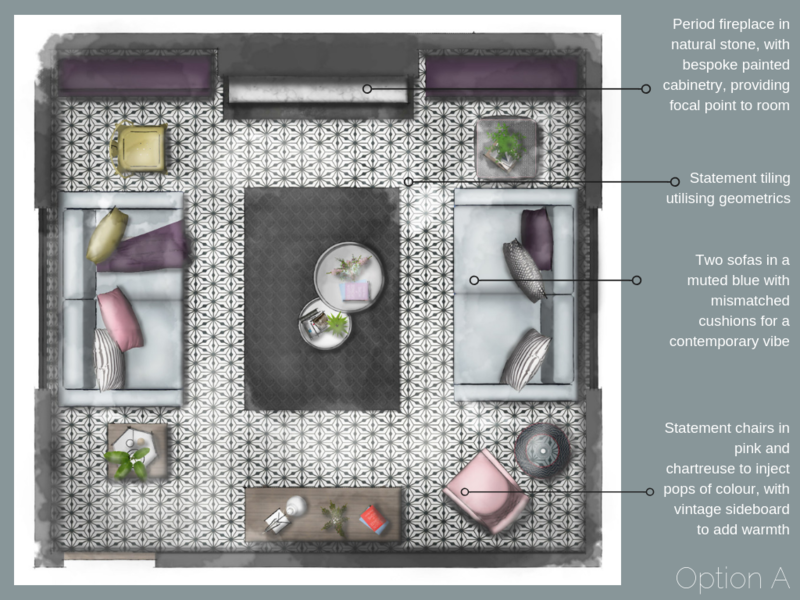 If you provide an e-design service, and include a floor plan as part of your bespoke package, then you should probably include a floor plan with colour and texture, or a watercolour illustration as these are much more informative and inspiring. It’s supremely difficult to inject a personal touch to an e-design service and therefore a technical floor plan would probably look quite cold and uninviting, especially if you aren’t physically present to breathe life into your designs. When producing a technical floor plan, don’t forget to include a border and title block (with key) to ensure your plan is presented as per recognised drawing conventions (you should include a border and title block in a floor plan that includes colour and texture too). Refer to point 7 for more details on how to present your final floor plan professionally. 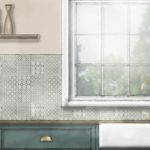 An illustrated floor plan shouldn’t be presented with a border and title block, because it is a more relaxed, whimsical and creative approach to the more traditional styles. 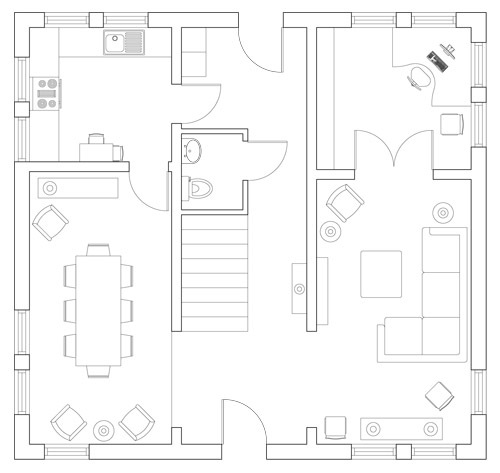 These types of floor plans look amazing as standalone documents, or as part of a client presentation pack. Straight walls, with corners that total 90 degrees (unless they are supposed to be at a different angle) are pretty much expected when it comes to floor plans that are of a professional standard. Wonky lines have no place on a floor plan. And when it comes to creating floor plans using SketchUp, the only way to achieve this level of accuracy is to use the green and red axis. You should consider the axis to be the backbone of everything you do in SketchUp. Become friendly with it, because you’re going to have a very productive and long working relationship. LET’S TAKE A LOOK AT HOW AWESOME (AND CRUCIAL) THE HUMBLE AXIS IS! Having an effective workflow is so important when producing accurate and precise floor plans. Part of your workflow should be using the tape measure tool to double check your measurements, because we can all make the odd mistake sometimes, and if you double check your measurements you’ll most likely identify errors and more importantly, rectify them before you present your plans to clients. There’s nothing worse than presenting a floor plan to a client and realising your measurements are wrong. 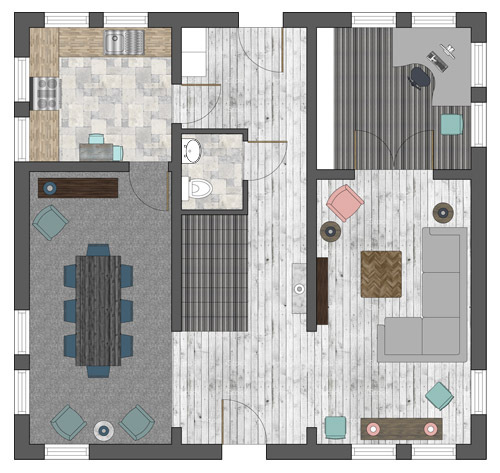 Additionally, it is absolutely infuriating to create a floor plan, and devise a furniture layout and then spot a few inaccurate measurements, which impact on your overall design and result in you having to reconsider aspects of your layout/furniture selection. Floor plans, by their very nature are supposed to be highly accurate and precise. It’s your duty, as an Interior Designer to make sure you produce plans that are accurate and reliable. There are tools in SketchUp that help you create precise geometry, for example, enabling end points will allow you to clearly see the end of your lines so that you are connecting geometry precisely, with no gaps, or overshooting geometry. Even something simple, like zooming into your geometry to ensure you are able to see it clearly, will help you tremendously when creating floor plans of a high standard. Another use for the tape measure! 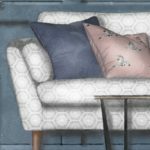 You need to make sure that your items of furniture reflect the correct size being used in reality AND you need to make sure that they are in proportion to the size of the room and other pieces of furniture contained within it, especially if there are architectural features, or current pieces of furniture that will be staying in the new design scheme. 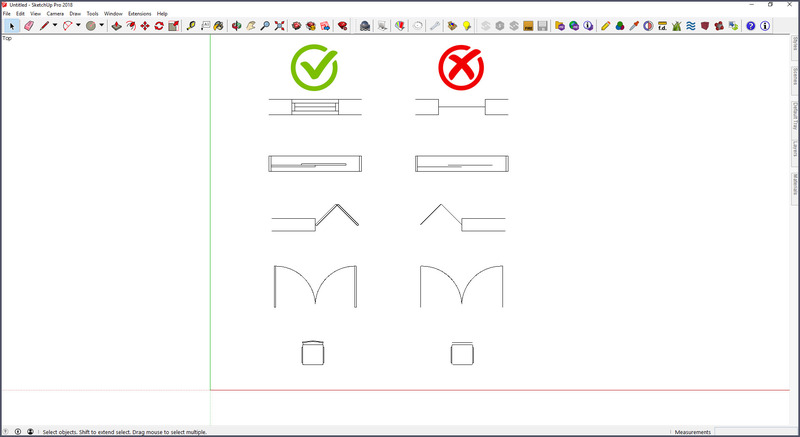 We provide pre-constructed 2D symbols in a SketchUp file in course #3 Creating a Furniture Layout & Lighting Plan, but you MUST make sure that you check the measurements of the bed/chair/sofa you’re thinking of using and reflect its dimensions accordingly. If you haven’t selected a specific item of furniture yet, a quick Google search with the term ‘standard size of…’ will undoubtedly produce a hefty list of results. Or you could investigate the sizes of furniture being sold by reputable online retailers and use these measurements as a reference point. Now we’re starting to separate the novices from the professionals! When positioning items of furniture make sure you carefully consider its proximity to walls and other items. For example, if you are positioning a bed in between two bedside tables, make sure they are the same distance from the bed. If you are placing a free-standing bath in front of a window, make sure the bath is centred. Here’s a great tip on how to do this efficiently and precisely without using a tape measure! But don’t fret! We’ve got your back! We show you how to position your furniture precisely using the tape measure tool in course #3 Creating a Furniture Layout & Lighting Plan. You should always include recognised drawing symbols in your floor plans, and if you need to create a new symbol, you should provide an explanation of it in the key. In this digital age, there’s no excuse for not being familiar with the typical 2D symbols used in floor plans. 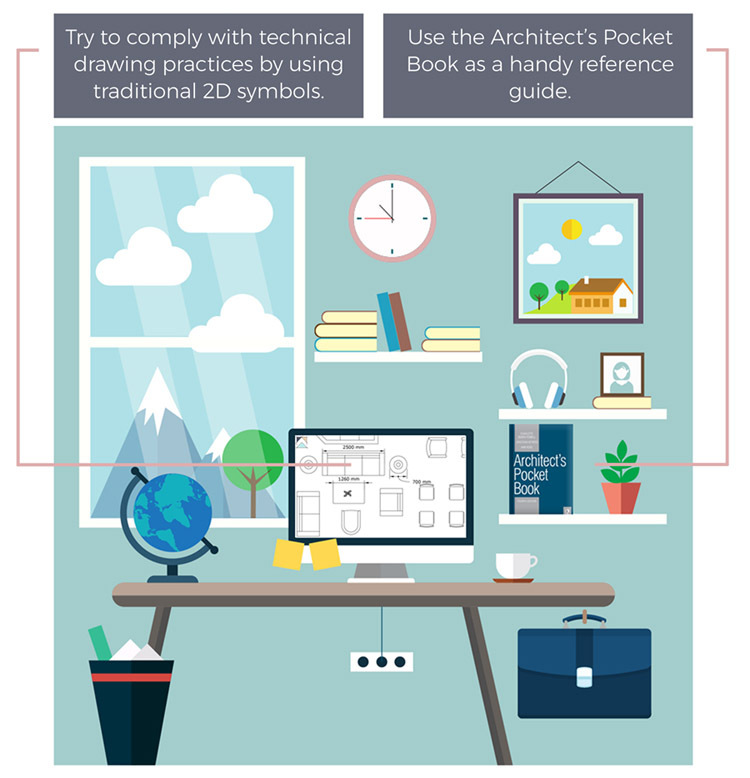 A quick Google search of ‘2D floor plan symbols’ should provide ample inspiration, or you could purchase the Architect’s Pocket Book, which is an excellent reference guide for both Architects and Interior Designers alike. We’ve witnessed many new students at the SketchUp Hub creating items, or aspects of an item using a single line and we’re not fans of this. It’s a slightly amateurish and lackadaisical approach. All symbols which represent an item or piece of furniture should have a thickness applied. It’s maintaining these types of standards, that ensures you will always produce high quality plans. 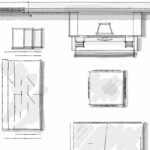 Consider using different line weights or dashed lines to draw attention to various elements of a technical floor plan. Traditionally, thicker line weights are used to denote the main walls, with furniture having a finer line weight. You can still acknowledge line weights in a floor plan that includes colour and texture. Dashed lines are useful for highlighting under counter appliances, wall cabinets or anything else hidden from view like archways etc. And finally, when it comes to (technical) drawing conventions, the ultimate in professionally presented floor plans are those that are to scale and encompass a border, title block and completed key. 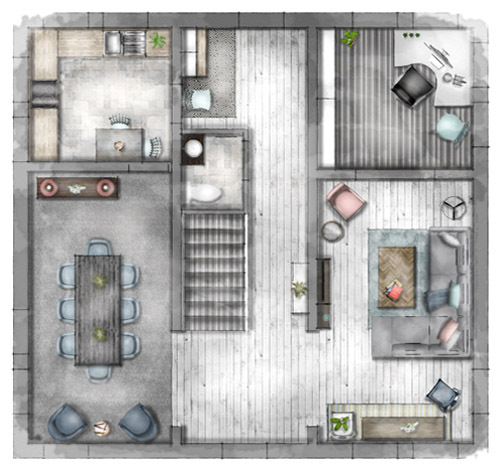 This floor plan has been saved at high resolution so that you can click on it and zoom into all the glorious details! The above floor plan has been presented accurately, with careful attention to detail and includes all of the attributes of a professionally presented plan. We have listed these below and have provided additional expert tips to make sure you produce a floor plan of a very high standard. the floor plan has been exported at high resolution so that it is clear and easy to read, this also means it will print to a high quality. We recommend that you export your floor plans as a PDF because they are generally high quality documents, all of the attributes of a floor plan, including text and dimensions are of a high standard in PDF format. 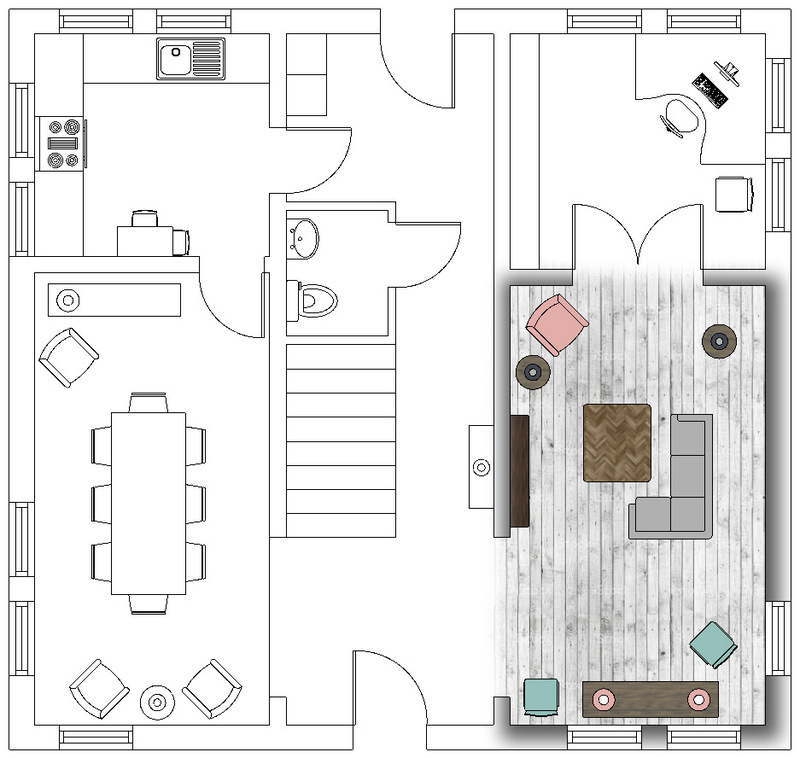 If you need to save the floor plan as a JPEG for inclusion in a client presentation, export as a PDF and then open in Photoshop and save as a JPEG. 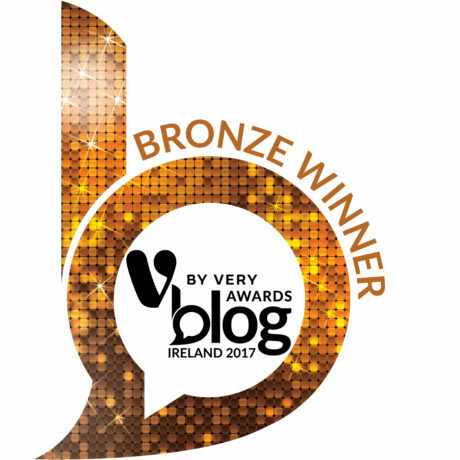 a border, title block and key have been included. The key includes an explanation of a number of 2D symbols used in the floor plan, information about ceiling heights and design details in the ‘notes’ section, information pertaining to the client/project and a small element of branding. Remember to accurately align all of the text included in the title block and adopt a consistent approach to font styles and sizes. Incorporating a workflow that helps you ensure your floor plan has been constructed accurately and with precision is crucial. A workflow will help you identify any errors and rectify them before you present your plans to Tradesmen or clients. 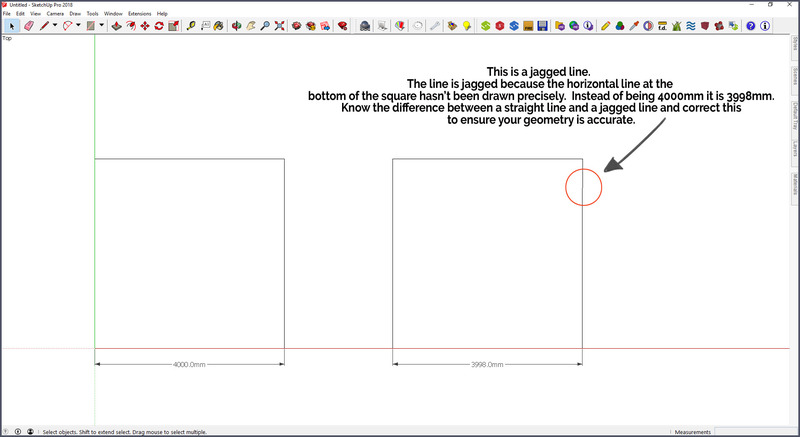 making sure the red or green axis is visible when drawing straight lines. You should be able to identify a line that isn’t straight very quickly because the line will be jagged. If you spot a line that is jagged, this should ring instant alarm bells. Your next step is to zoom into the geometry, delete the line and redraw. If the red or green axis doesn’t appear, investigate why this is happening and correct the error. now you’re ready to export and prepare your floor plan in LayOut. 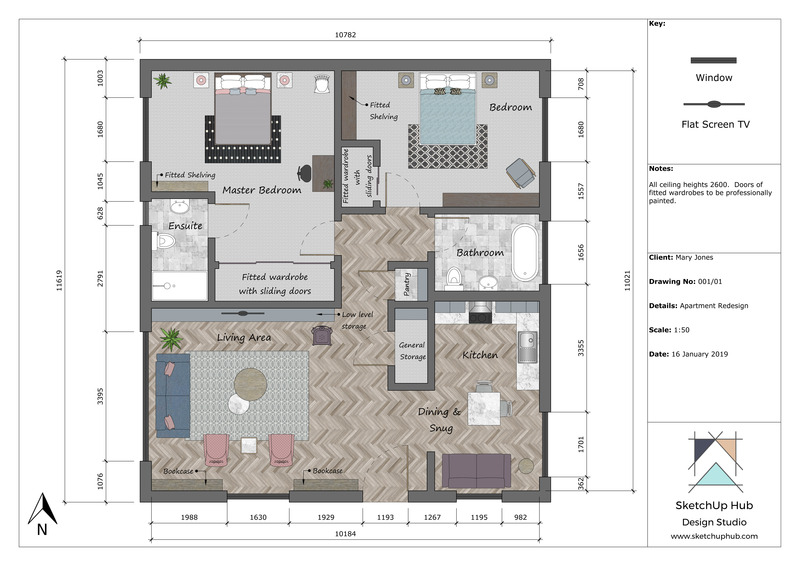 We hope you’ve found this article useful and are inspired to create accurate, precise and highly professional floor plans that you can be proud of! 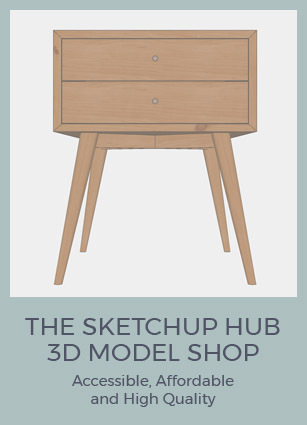 Register with the SketchUp Hub and take course #1 The SketchUp Interface for free! 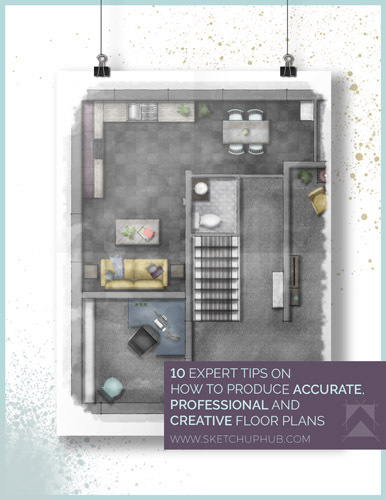 You’ll also receive a free eBook on our expert tips when creating accurate, professional and creative floor plans. Rendering Wall Panelling – New 5 Day Challenge! 0 responses on "Expert Tips on How to Create a Professional Floor Plan"